The Sydney Development Fund, which manages fundraising and donation drives for USyd, has sacked 53 University of Sydney students, after the Sydney Telephone Program shut down operations for the year. This comes after ongoing pay disputes between the call centre and its staff. The casual workers were informed of their employment termination in an email sent to staff yesterday afternoon. The Sydney Telephone Program, a call centre that employs students to dial alumni and solicit donations for University programs, is run by third-party contractor Ruffalo Noel Levitz, a US-based fundraising company. In the email, Director of Operations, Heather McMurrin, cited “operational reasons” for the closure. The University has stated that the calling program will continue to run next year, with employment decisions made by the telephone program supplier. It is unclear whether Ruffalo Noel Levitz will take the contract in the future. However, many students were left in the dark about the reasons for the closure. The students’ contracts with Ruffalo Noel Levitz stipulate that their employment can be terminated with one day’s notice, but many believe that the University owes them better treatment. Hersha Kadkol is a second year History student who started working at the call centre in March this year. The employees were invited to an “employee meeting notifying staff of the closure” held this morning. It was unclear whether attending the meeting would be remunerated. Kadkol said that, at the meeting, Ruffalo Noel Levitz gave no additional reasons for the call centre’s closure. The Sydney Development Fund told Honi that Ruffalo Noel Levitz informed USyd of the imminent closure on 26 September, and operations would cease today, on 6 October. “The University asked Ruffalo to communicate the anticipated end of the program as soon as possible. As their employer, RNL managed the communications to the student callers,” the spokesperson said. 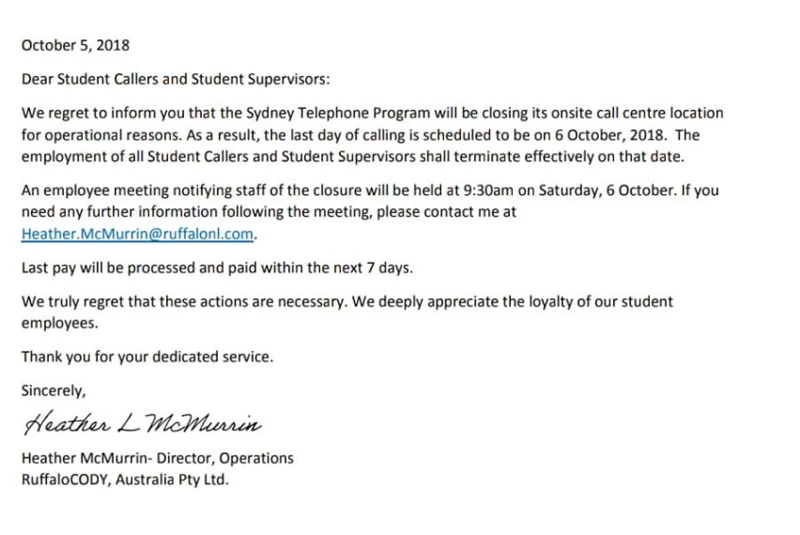 Honi understands the manager indicated at the meeting that, if the call centre reopens in the future, it will not automatically rehire the same workers. The meeting was unpaid. The callers, who were based on campus, rang alumni six days a week. Under the contracts, the employees were limited to a maximum of 18 hours a week, working shifts of 2-3 hours. Another student employee, who wished to remain anonymous, said many workers were “distraught” today. According to the employee, the managers refused to elaborate on further reasons for the closure due to their contracts with Ruffalo Noel Levitz. The programs manager and director of operations of the call centre did not respond to Honi’s request for comment. The closure comes after ongoing disputes over pay between the centre and its employees. Last year, Honi reported that fundraising staff were paid 25 per cent less than other University employees, because the staff were contracted to a third-party company, rather than the University. On the date of termination, employees were paid at $26.14 for regular hours, and $31.37 for work after 7pm and weekends, in line with the minimum amount set out by the Contract Call Centres Award 2010. Last night, the University’s Career Hub website still advertised the fundraising job on its website, listing the position with remuneration between $30.58 and $36.70. A third year Bachelor of Science student, who also wished to remain anonymous, claimed that she brought the discrepancy up with her supervisors at this morning’s meeting. According to the student, the managers allegedly assured the employees at several points in the meeting that the difference in their pay with the rate advertised had been an oversight, and would be back-paid. “The manager and director told us that they made a mistake, and then after the meeting, they changed their mind,” the student said. But this afternoon, following the call centre’s final shift, employees received an email from the director of operations, saying that the students had not been underpaid. The issue remains unresolved. Kadkol complained about the culture of the call centre’s workplace, saying that casual workers “can just get stamped on”. She said workers were encouraged to reach out to friends and family to donate to the University in exchange for entering a prize draw. The assortment of prizes included two iPads. In the end, only one iPad was given as a prize, which turned out to be secondhand. Another worker claimed that they had been promised a $100 gift card, for receiving the most donations in one night, however the card was only loaded with $40. At this morning’s meeting, the director of operations told the employees arriving for 10am shifts that they needed to leave the call centre floor or begin to dial and work, otherwise campus security would be contacted.